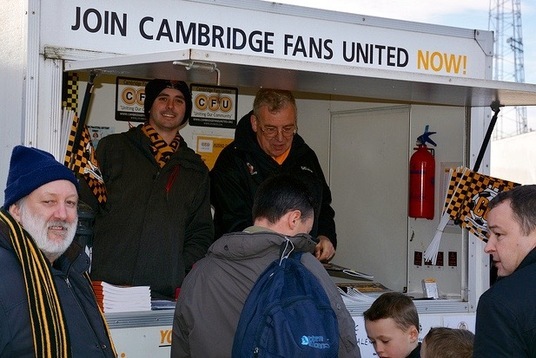 Cambridge Fans United is the supporters' trust associated with Cambridge United Football Club. 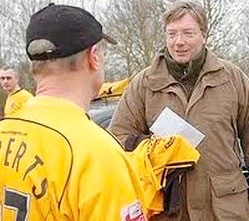 The trust, which works on behalf of all supporters and with the football club, has existed since 2000. 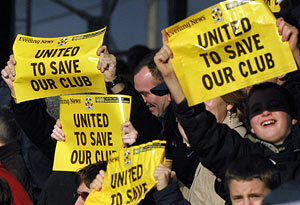 It is represented on the CUFC board by Fans' Elected Director Dave Matthew-Jones. CFU, which is a member of Supporters Direct, is welcoming, inclusive and forward-thinking, with a positive attitude to challenge. 100 Years of Coconuts is a CFU initiative. To join CFU, click here. ​If you would like to know more about the trust, go to: www.cambridgefansunited.org, call 079577 344005 or write to: Cambridge Fans United, c/o Cambridge United FC, Abbey Stadium, Newmarket Road, Cambridge CB5 8LN. CFU in action: campaigning for change (above) and discussing Bideawhile plans with a director.